Odette and Prince Derek are reunited. At his coming-of-age ball, Siegfried sees Von Rothbart with someone who is the spitting image of Odette - she is of course the Black Swan, Odile. They dance and Siegfried declares his love for her. 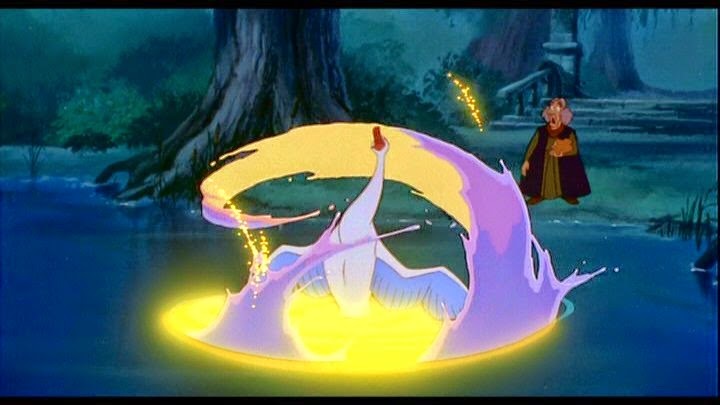 But he sees the real Odette running away, realises that he made a terrible mistake and pursues her. But it is too late for him to break the curse. Odette forgives him but she can no longer live as a slave of Von Rothbart and decides to take her own life. 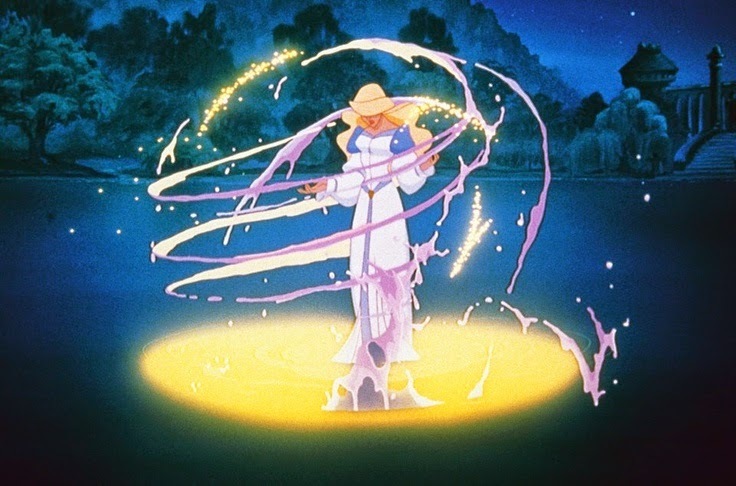 In some versions of the story, she is killed accidentally. Her death not only frees her from the spell but destroys Von Rothbart. His death in turn breaks the spell on all the other maidens. Why does Odette's death kill Von Rothbart? If you've read the Harry Potter books you will probably realise that Odette must be a horcrux for Von Rothbart, just as Harry Potter was for Lord Voldemort. Is Voldemort based on Von Rothbart? Hmm... never mind. Why would Von Rothbart chose a fragile vessel such as Odette as a horcrux? It must have been accidental but he knew that she carried his soul, otherwise he would not have been so maniacally possessive of the poor girl. The Avada Kedavre curse can be used to create and also destroy a horcrux. 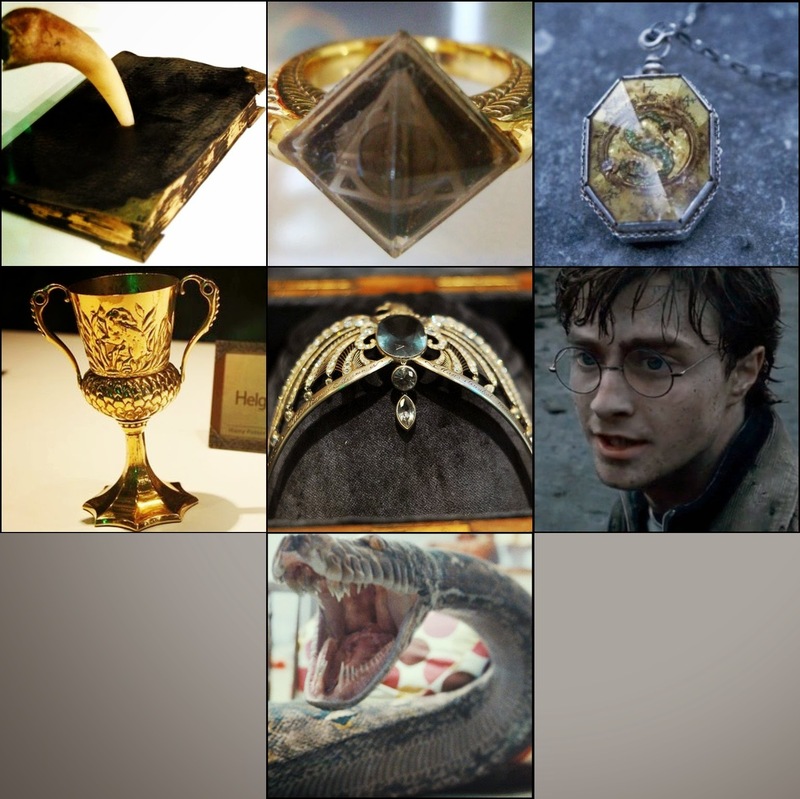 The most important horcrux was of course Nagini, who incidentally was a shape-shifting naga, not just a serpent. Moving on to Swan Lake again. So which Russian folktale is Swan Lake based on? The experts may not agree but I think its the Frog Princess. 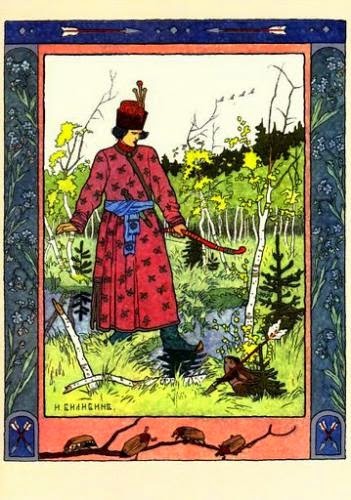 Not the Disney version but the original Russian folktale, Tsarevna Lyagushka. Prince Ivan's arrow lands in the swamp and the frog princess finds it. To keep his promise to his father, Prince Ivan must marry the frog. Even after the marriage, he never sees Vassilisa in human form. This could be a residual effect of the spell cast by Kaschey, because he falls asleep the moment Vassilisa transforms into a woman at nightfall. either by him or his garden, where everything is made of gold. 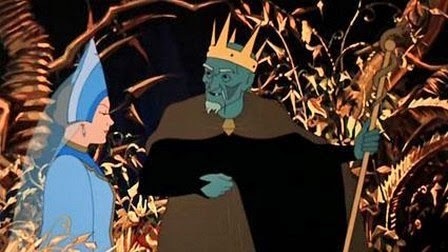 Image is from an old and very fabulous Russian animated TV series. But the interesting part is that Kaschey, like Von Rothbart and Voldemort, is deathless. Fortunately for the prince, Vassilisa is not a horcrux, which is probably why she was allowed to live alone in a swamp in the first place. When he finally sees Vassilisa as a woman at a ball, he falls in love with her but makes the mistake of burning her frog skin... Vassilisa is swept away by Kaschey again. Unlike Von Rothbart, Kaschey is diabolically clever. 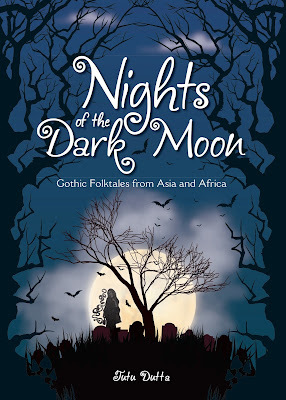 In the story, Ivan is told that Kaschey's life is 'at the point of a needle which is inside an egg, which is inside a duck, which is inside a hare which is inside a stone box located on top of an ancient oak tree." The only way to kill Kaschey is to break the tip of this needle... Fascinating! Are there more fairy tales with horcruxes? The most obvious one is Snow White. Is it the poisoned apple or the raven or perhaps even Snow White herself ? No, it's the magic mirror of course. But whose horcrux? Why the Evil Queen's of course. 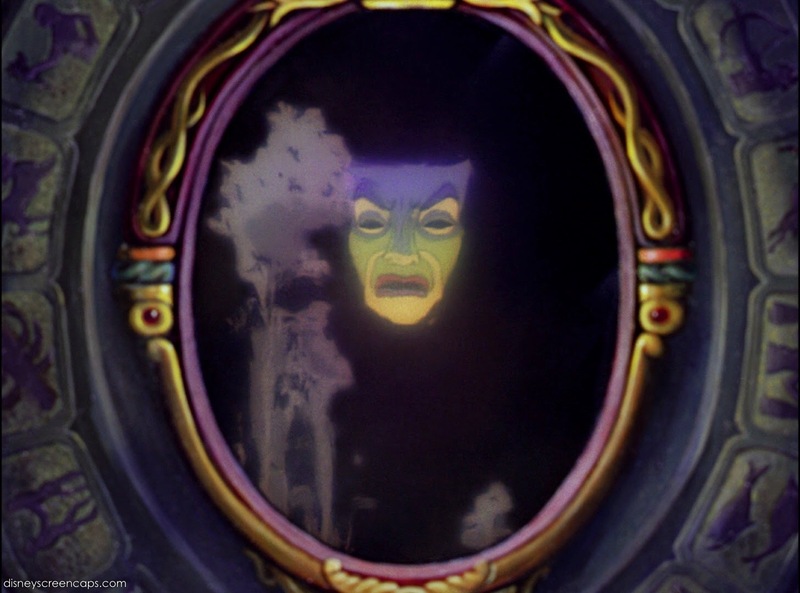 Did the queen know that the mirror contained a fragment of her soul? Most probably not, otherwise she would never have destroyed it and herself in the process. It was created unintentionally, probably when she spent so much time looking into, and talking to the mirror. The demon in the mirror may have stolen part of her soul. Such a potent magical artefact should not be trifled with and the queen may have fallen under its spell without realising it. The fearsome all-knowing mirror which is always compelled to tell the truth. Reverting again to Harry Potter, the Mirror of Erised was supposed to have the ability to cast a spell on unsuspecting people who gazed too long into it... After all, there is an ancient superstition that looking too long into a mirror will result in your soul being trapped in the mirror... as in the case of the urban legend of Bloody Mary in the United States.